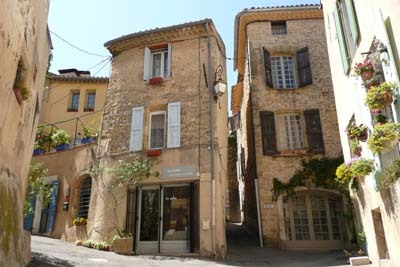 Try the small village of Lourmarin, in the Luberon region of Provence. OK, it's not one of those hilltop villages right out of a Disney set, but it drips with charm nonetheless. (The name of the village is derived from the Provencal word for "The Rosemary", as in the herb. "Lou" is Provencal for "Le" in French, and "rmain" is a shortened version of "Rosemary". Think "Romain".) Anyway, Lourmarin is chock-a-block with restaurants and cafes, most all of them al fresco. The food is local, fresh and straightforward, with the church squares, winding streets and old houses you want in rural France. I remember spending a few days there several years back -- esp. one breakfast. I awoke early (as is my habit) and with my traveling companion fast asleep, I left her to her slumbers and went out to explore the village. It, too, was waking up, but the bakery was open (praise be) and I bought a baguette (a real baguette, certified by the French State as made from scratch at the bakery itself) and some local butter. With my trusty Swiss Army knife, I headed off to find a quiet bench. Find one I did, near a chapel and under a tree, where I proceeded to eat most of the baguette, slathered with the pale yellow gift of happy French cows. To amuse myself, I tried to count all of the swallows' nests that ringed my little throne as the freshness of dawn gave birth to the warmth of a summer day. Finding myself in need of some tea, I headed back to the main street, where I found a cafe opening. They were perplexed that I was not drinking coffee, but that problem aside, I had an actual pot of real tea (hooray!) and even was offered a newspaper, in which I recall reading about the latest French governmental scandal. In the sure and certain knowledge that my traveling companion was still firmly in the arms of Morpheus, I decided to explore some more, and came upon a barber shop. Well, such places can be hubs of local activity, and this was no exception. So, in I went, into the chair I sat, and I explained as best I could how I wanted my hair cut. The old fellows who were gathering there seemed amused to have this foreigner invade their little bastion, but they were welcoming enough, my college French proved more than satisfactory, and I got the low-down on the best local restaurants, country walks, and places to find handicrafts that were really artisanal and Provencal. All cleaned up, I headed back to the inn, where I found my traveling companion gulping down her first cup of coffee, as I sat down to my second breakfast of the day -- this time with a still-warm pain au chocolat, my pretty traveling companion, and my friends the swallows, who seemed to live in the inn's courtyard, too. Life is Good. Next trip to France I want to go to Lourmarin.